Dodge County was created in 1870 and was named for William E. Dodge, a New York businessman who owned large tracts of forest land in Georgia. The county’s total area is 500.6 square miles with a population of 19,171. Are you moving to Eastman or relocating to Dodge County? 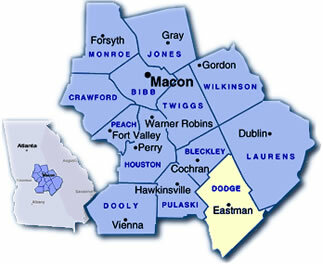 Use our quick search to find homes for sale in Eastman Georgia and Dodge County. Are you relocating to Eastman GA? Get your FREE relocation package!